Battle Princess Madelyn is a pixel retro side-scroller from Causal Bit Games. 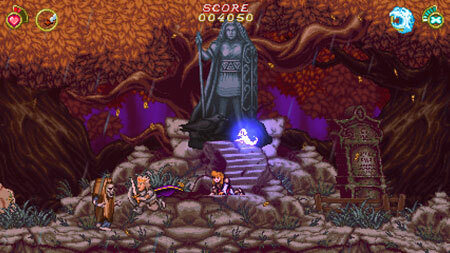 You will play as Princess Madelyn as you set off to defeat evil with your ghostly canine companion Fritzy. Save your family, avenge your furry friend and become the ultimate battle princess. Traveling the world through magical portals beyond the realms of time and space, you will journey to far off lands. For there is a kingdom, and it is up to you to save it from the terrifying clutches of an evil wizard. Tackling all manner of deadly foes, you will overcome sinister graveyards, murky swamps and looming castles to achieve your goal. Travel across the world using special portals to get from place to place. Fritzy has special powers to help you and assists you in your quest. Weapons are specific to certain areas, providing access to secret locations. If you get stuck in the game, check out the video walkthrough and gameplay for the game.